Despite that warning, on the morning of February third, over two thousand people formed a human ring all the way around the Australian Parliament House in Canberra. Mothers, fathers, grandparents, children, students, scientists, people from all walks of life and from all over Australia, committed what for some was their first act of civil disobedience. We were dressed in red to symbolise the climate emergency that the world is facing. This colour also symbolised anger, anger at the inadequate response to climate change from our Federal Government, and anger at the extreme danger this inadequate response puts us in. 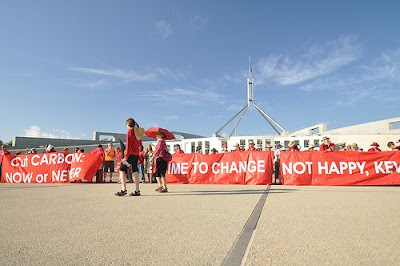 This action was the last official event of Australia’s first Climate Action Summit. This summit brought together over 500 people representing about 150 climate action groups from all over Australia, for three days of discussion, skills sharing, network and policy development and campaign strategising. Yarra Climate Action Now had four delegates in attendance. It was an exhausting, educational, sometimes frustrating, and inspiring experience. By the end of the three day summit, we were well on the way to establishing a national community level climate action network, which would enable all the groups to work together and coordinate our activities. We had also set our overarching campaign objectives and key dates for nationally coordinated actions. We took part in discussions on key policy issues and skill-share workshops. 1. Prevent the Carbon Pollution Reduction Scheme (CPRS) from becoming law. 2. Build community-wide action to demand green jobs, a just transition and 100% renewable energy by 2020. 3. Build community support for a goal of stabilisation at 300ppm CO2 in the atmosphere and strong international agreement in line with what science and global justice demands. Communicate this position to the Copenhagen Conference of Parties and advocate for the Australian government to adopt this position. These objectives are consistent with the climate science as it currently stands, and mean that the grass-roots movement, together with a few larger environment groups such as Greenpeace, are setting the agenda for the development of sensible climate change policy. No other groups, or government for that matter, are yet to base their climate change policies on climate science. Please contact us if you would like further information on these objectives.